Air pollution is a problem we once thought was improving. This air pollution article looks at some of the main causes of air pollution and some ways of protecting ourselves - and lessening our contribution to the problem. Here are some basic facts about air pollution, as it has been - and as it is now. These brief outlines of major environmental problems are offered as a quick over-view only. The issue of air pollution is far too big to do justice to on a website such as this. The facts presented here give you a broad look at the issues. Air pollution first arose as a major health hazard during the industrial revolution. Industrial towns in Britain used to be notorious for their bad air, caused by smoke from belching factory chimneys. On top of that, nearly everyone burned coal fires to warm their homes. In the 1950s the Clean Air Act in Britain helped end the winter "smogs" (smoky fogs) which had engulfed London and other cities for a century or more. The traditional "pea-souper", which had been responsible for so much misery and ill-health, was no more. People could no longer burn coal in towns; they had to use "smokeless" fuels such as anthracite. The levels of bronchitis fell dramatically. Today, many people in the developing world still suffer similar problems to those experienced by 19th century Europeans. Coal-fired electricity plants spew out toxic waste gases and burgeoning traffic adds exhaust fumes to the brew. China has become notorious for its air pollution; during the Olympic games factories were closed so as to mitigate the effects. Even so, the pollution was often visible in the pictures beamed across the world! Coal-fired power stations are a big part of the problem, as is ghe increasing dominance of traffic in many cities. Many cities world-wide are impacted by air pollution, even ones in the affluent parts of the world. Paris and London both have unacceptable levels of pollution at street level, affecting the local population and causing premature deaths. One of the main culprits is diesel powered traffic. So, air pollution still is a huge problem in the developed world and it's an ever growing menace in the developing world. But in recent years a new danger has become apparent: photochemical smog. Photochemical smog is less visible than the old kind of smog. But it is just as deadly. Photo-chemical smog is at its worst on days of bright sunlight because the sunlight reacts with exhaust fumes from cars to produce a lot of ozone. Ozone can irritate the lungs and is particularly bad for people with asthma. Tiny particles (called "particulates") are produced by traffic fumes and other pollutants which get deep into the lungs, causing health problems. Air pollution comes from lots of different sources. The main ones are industry and traffic. Air pollution is partly caused by particulates in the air. Particulates (or particulate matter) are simply small particles of a variety of substances such as soot. Some particulates are formed from dust and pollen and other organic stuff. Other particulates come from chemical sources such as the combustion of fuels (industrial processes and traffic). Further types of particulates are created by chemical reactions when sunlight acts upon the chemical brew of industrial pollution, dust particles, pollen, sea spray or other water vapour, and any number of other elements. This process creates "photochemical smog", a nasty, persistent blanket of damaging gases and particulates which can linger for days over densely populated towns and cities. Particulates are important because they cause health problems, especially problems with respiration. Which gases cause air pollution? Nitrogen oxides are a very reactive group of gases which are released into the atmosphere whenever fuels are burnt. This means that every time you fire up the central heating, or take the car down to the shops, you are contributing to the problem. These gases react with the particulates and other chemicals. Nitrogen oxides also cause that reddish haze that you can often see hanging in the air near the horizon on warm days. Nitrous oxides (one type of nitrogen oxide) are responsible for many health problems. Nitrogen dioxide is one kind of nitrogen oxide which is particularly harmful as it reacts with sunlight to create ozone. Ozone is a useful chemical when it is in the upper atmosphere, where it helps to protect the earth (and us) from the sun's ultraviolet radiation. But at ground level, it has a bad effect upon respiration. Not enough studies have been done to be certain of its effects upon human health. It is believed to worsen the effects of pollens - and other allergens - upon peoples' respiratory systems. Ozone concentrations tend to be worse in the afternoon and in rural and suburban areas. The chemical reactions that cause ozone creation occur in built-up areas but the effects are actually worse further afield. 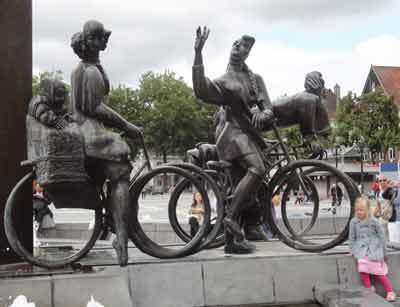 This sculpture of cyclists is from Bruges, Belgium where cycling is a way of life. Please see the Green Transport section for more on this. This air pollution article only has broad sweep ideas. See also below the book reviews for ways to protect yourself from air pollution. How to Grow Fresh Air: 50 House Plants that Purify Your Home or Office Full details of how these plants work to help purify your indoor air plus cultivation and propagation tips. My House Is Killing Me! : The Home Guide for Families with Allergies and Asthma A detailed exploration of all the common allergens, including modern chemical ones, and how to avoid them and remove them from your home environment. Environmental Science Activities Kit: Ready-to-Use Lessons, Labs, and Worksheets for Grades 7-12 (J-B Ed: Activities) A great resource book for teaching environmental science, biology and even the sociological aspects of the environment. There are plenty of easy to use activities and discussion topics with notes. Here are some ways you can protect yourself and your family from the worst of photo-chemical smog and pollution from traffic. Pollution tends to be less bad indoors. Avoid being in very polluted areas if possible and especially avoid exercising in polluted areas. Listen to and watch the weather reports. They often give details of pollutant levels. Avoid polluted areas particularly in the afternoon when ozone levels are highest. 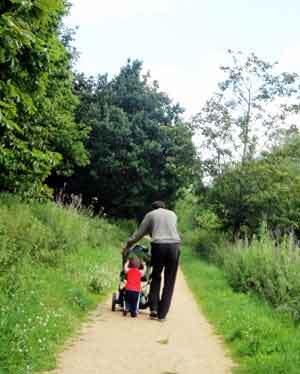 Choose back routes down quiet streets where possible, especially if you are walking with small children. Pollution is often worst at toddler level - about two to three feet from the ground. It also declines sharply a street or two away from heavy-traffic areas. Avoid driving or being in cars - pollution levels inside cars are worse than outside them, even at pavement level. If you want to comment on this brief air pollution article, please use Facebook below. Please add your own suggestions for how to improve it! Thank you.